Tender and juicy, this amazing schnitzel will blow your mind! 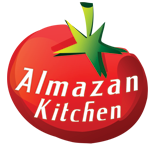 Simple yet delicious, with creamy butter sauce, fried baby onion flavor notes and coal baked sweet potato… Right in the AlmazanKitchen style! We need no more words, do we? Let’s cook it! Recipe is below! Take 1 sweet potato, and dig it right into the coals. Let it cook there while we’re doing following steps. Take 400g of free-range beef leg. Salt & pepper it. Beat the meat as thin as possible. Toss in the meat and fry it for 2 min on each side. Take 3-5 baby onions, cut in half and toss into the pan. Toss into the pan 3-5 mini chilies. Add ½ tbsp. of aged balsamico above the meat. Lower the heat, add 2 tbsp. of butter and fry for 1-2 min each side. Flip halfway, add ½ tbsp. of aged balsamico above the other side. Remove the sweet potato from the coals, unpeel from the burned parts then slice it. Serve meat with sweet potato. Dress with handful of fresh parsley, chilies and sauce from the pan.